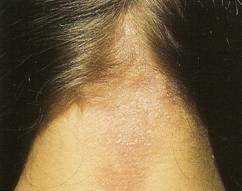 Allergic Irritant Scalp Reaction presents varying symptoms including; facial swelling, breathing difficulty, pain, erythema, irritation, dryness, tightness and many more. The cause and severity may vary and in some cases a reaction can lead to substantial hair shedding and even hospitalisation. Therefore you should seek medical advice immediately if you believe you are suffering from a scalp reaction and any form of swelling or breathing difficulty occur. The potential long term issues should not be overlooked. Therefore you must deal with a scalp reaction with ASAP. Give us a ring and we can advise you on what to do next. Hospital – If you are suffering any facial swelling, shortness of breath, considerable pain or severe burning then you need to seek urgent medical help. Go to your GP or A&E right away. Therefore you should not waste time. Consultation – If the symptoms include redness, itchy scalp, dry scalp, tightness, moderate burning or feeling of warmth then it would be best advised to seek professional advice. You are welcome to ring us if you so wish. Often a scalp reaction can be dealt with simply and quickly. Phone advice – If you decide to ring us then we may well be able to advise you on the phone. This may include changing you cleansing routine and maybe refraining from using certain chemicals. It may well be the most appropriate thing to arrange a visit so we can see the scalp. A consultation either on the phone or by visiting is free. Treatment – the key to treating a contact reaction is to calm the skin. That may sound simple but when the skin is unhappy it will proliferate at a much greater speed causing flaky skin to appear along with erythema (redness) and other symptoms including a burning sensation and sometimes pain. So attempting to remove the delicate skin is not an easy task and is open to secondary infection if not completed correctly. We prepare the skin making it pliable and soft. This will allow us using a specialist technique, to remove the loose flaky skin. Once the skin is free of crust we can get to work on calming the underlying skin. An irritant contact dermatitis (irritant reaction) presents as an acute skin condition caused by exposure to chemicals, solvents, acids, alkalis, adhesives, detergents and certain plants. Severity varies and symptoms may include mild erythema, scales, swelling, vesicles (small blisters), pruritus, skin breakage, a burning sensation and a glazed appearance. Bullae (large blisters) and even necrosis (destruction of tissue) may occur in extreme cases. shows no affiliation to skin colour, age or gender. Atopic types are particularly susceptible. Severity depends on immune strength, potency, duration of stimulus and humidity. The irritant penetrates the epidermis (destroying oils and fluids) triggering an immunological reaction. Allergic Contact Dermatitis results from repeated exposure to allergens (substances harmless to most, which the body is allergic). The condition may develop at any age showing no affiliation to gender. Allergic contact dermatitis tends to affect the hands, ankles and scalp. Symptoms include pruritis, erythema, swelling, oozing, scales, hyperpigmentation and a rash. Severe cases may present blisters which dry and form a crust. Symptoms of a contact reaction tend to become apparent within 12 hours of secondary exposure peaking after three – four days. Sensitivity may last a life time. Shoe dye and rubber especially in training shoes. Sweat may cause exacerbation. Leather may contain dye. Metals such as nickel chromium found on watches and cheap earrings or costume jewellery. Rubber gloves, poison ivy, house cleaners and cosmetics. Bergamot oil found in some fragrances induces dermatitis when exposed to the sun. Ylang-ylang oil, Sandalwoods,hair dyes and lavender oil may induce hyperpigmentation. Contributory factors include pre existing skin conditions e.g. irritant contact dermatitis, atopic dermatitis, cuts grazes, substance type e.g. acid, alkaline or salt, concentration, exposure time and frequency. Sweating may dissolve the chemical, increasing the toxicity or may dilute reducing the effects. Dry air causes chapping which may increase susceptibility. Please feel free to call us if you are worried about this or any type of scalp condition. Alternatively, complete the contact form and we will be pleased to call or write back.